August is one of the best months for farmers markets. Vendors are overflowing with all kinds of fresh, local veggies. 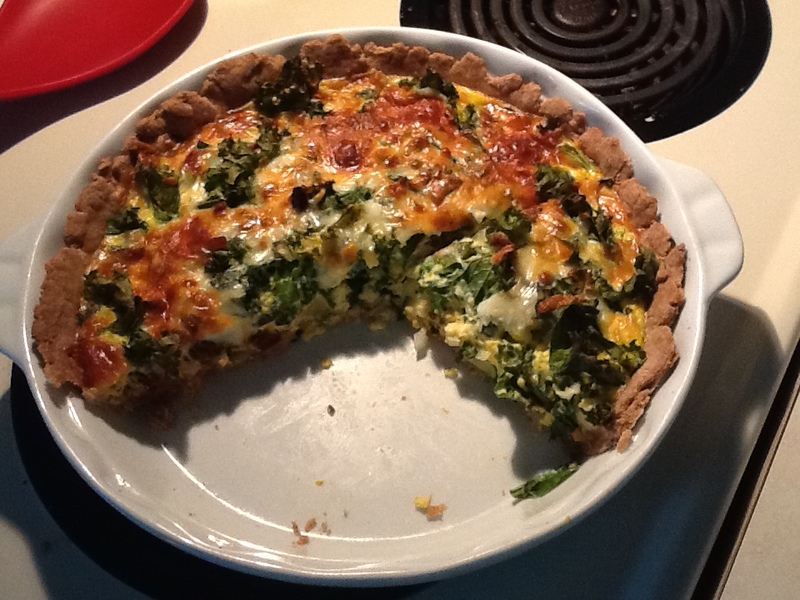 I used some veggies I bought at the farmer’s market, as well as some from my own garden to throw together this quiche. The great thing about this recipe is you can use whatever veggies you like, in any combination. Plus, the crust is made with spelt flour (you can substitute a different flour if you prefer) and olive oil, cutting some of the calories from a traditional butter crust, without eliminating flavor. And other than a trip to the farmers market, the rest of the ingredients are staples in most households. So no extra trip to the grocery store necessary. A great quick and hearty lunch for a low-key weekend. Preheat oven to 375 degrees. Combine all ingredients until dough forms a ball. If dough is still too dry, add 1 tbsp of water until dough is the right consistency. Roll out dough. Spray or butter a pie plate and place dough in in pie plate. Chop up veggies. Add fresh herbs to the mix (optional). Place layer of veggies and sun dried tomatoes in bottom of pie plate. Pour in egg mixture. Finish with layer of your favorite cheese. Bake for 35 minutes, or until egg is cooked through and crust is golden brown.